When Republican presidential hopeful Donald Trump announced his running mate to the world last week, something else was revealed, the “official” campaign logo (above). Initial reaction was, overwhelmingly, negative … except perhaps for late-night talk show writers/hosts who, let’s face it, consider Trump the gift that keeps on giving. But I digress. Response was so negative, and mostly R rated, that the campaign made a quick modification to the version below. Now, graphic design is similar to art, not everyone agrees all the time about what is “good” and what is “bad.” However, most graphic design, especially a logo, is not designed for contemplation. It’s designed to communicate, instantly. 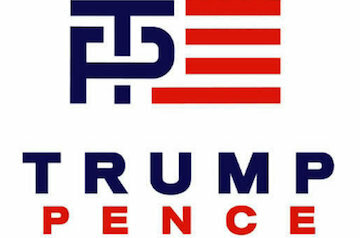 The initial Trump/Pence logo accomplished that, but the message was not what the campaign intended … at least I certainly hope it wasn’t. Some logos fall flat and really don’t communicate anything, even the name of the business or organization, which is as basic as it gets. There’s a tendency to really stress out and overthink the logo development process. Trust me, I know. I’ve done that, with a lot of help. I consider myself a survivor in this particular field of battle, so please allow me to give you the opportunity to learn from errors of my own, and many others. You don’t need to be cutting edge. If you start reading articles on the latest logo designs, your eyes soon will cross at terms such as “minimalist,” “undesign,” and pretentious uses of “flat,” and “smooth.” Don’t get me wrong, professional graphic artists and marketers who are interested in starting trends instead of following them need to be up on the lexicon, but more than likely, you just want something reasonably eye catching (in a good way) that gives people an idea of who you are and what you are doing. By definition, trends change. You don’t want to invest even a few dollars in a logo design so eclectic that you have to update it in five years. Don’t steal. If you think that you can be innocent of copyright infringement by taking someone else’s design, changing the colors and maybe adding a wave here or a flourish there, think again. Stealing a design from an artist, organization or business is no different from stealing a “secret sauce” recipe from a competitor’s restaurant or an automobile from a competitor’s car lot. Unless you are Nike, the Red Cross, Target or other big leaguers, you need text in your logo. If your organization’s name is really long, try initials, an abbreviation or acronym. If your business is well established in the area, use that name with pride. Don’t make it tough for faithful customers to find you simply because you feel it’s time to update your logo. Spend some money. Unless that nephew who is “really good with computers” has a portfolio to show you, don’t depend on him for something as important as your logo. A professional graphic designer need not break the bank. There’s a lot of good talent out there, and some very talented young graphic artists who need to add to their portfolio who will give you a good deal. Doodle. Have zero art talent? Who cares! You are a consumer of graphic design, and when it comes to communicating your ideas to a graphic artist who will produce your logo, your notes and doodles will be as valuable as your words. If you see a style of logo that you like, or color palette, it’s fine to send links to your graphic artist, but remember, don’t steal designs. Here are some ideas and links that might help you start the process. Pinterest. You can find pins on fonts, color palettes and a recipe for a nice mocha frappe to drink while you’re doing your research. Abbreviations and acronyms. Make sure that great shortcut for your business isn’t already used by someone else. This can be a copyright issue as much as a design. Consider an online logo design service. This is a brand new list of vendors and comes from Top Consumer Reviews, which is accredited by the Better Business Bureau. Local talent is by far the best way to go for customer service. Nothing beats sitting down opposite a graphic artist and reviewing those doodles, mission statements, current designs and color palettes together. There’s much less room for misunderstanding regarding deadlines and budgets, too. With that said, some of the vendors on this list may be worth trying for the cost savings. You can research customer reviews, but keep in mind that there is a lot of trolling going on out there, so a business could be padding positive reviews or getting assaulted by a competitor. I can connect you with a professional graphic artist who won’t break your bank, and I can help you navigate the entire process. So please give me a call if I can help. As I said, I’m a survivor on this battle field.